Celebrations in Rajasthan range from the religious to popular and from cattle to camel fairs. In more recent years the tourism has taken active part in conducting tourist fairs and showcasing the artistic talents of the people. Lets take a look at some of the festivals celebrated in Rajasthan. A festival of colour with different nuance. The kites take to the sky all over Rajasthan. In the evening kites with lights in them add to the twinkling skies above. The main places of celebration are Jaipur and Jodhpur. The main kite flying day is on the 14th January ie Makar Sankranti day. There are also kite flying competitions held where one can take part and win prizes. A 175 year old fair which is dedicated to Malinathji, one of the rulers of Jasoi village. It is held on a dry river bed and signifies trading in Marwari, Kathi and Sindhi horses. Some mystical elements associated with the fair include the rise of approximate two feet water for only the period of the fair and the tying of animals to posts in the soil which is otherwise very soft for it. An annual event at Jhalawar's Chandrawati on the banks of the Chandrabhaga river. This is a cattle fair and attracts thousands of cattle traders from Rajasthan and nearby states of Madhya Pradesh and Maharashtra. On the night of the full moon the traders turn pilgrims and bathe in the sacredwaters of the Chandrabhanga. Rajasthan's most famous fair. It brings together the camel traders, pilgrims, visitorsand others who are here to see this colourful event. There are tented camps, there are hundreds of shops selling everything from handicrafts to spices, foodstuff and jewellery. 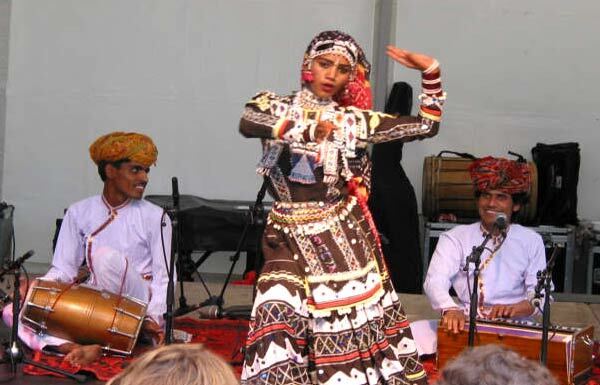 For visitors a number of activities are also arranged but most simply wish to stay within the fair grounds to watch the fascinating Rajasthani village metamorphse before the eyes. Dussehra commemorates the killing of the 10 headed Ravana by Rama, hero of the Indian epic, Ramayana. An effigy of Ravana is lit stuffed with firecrackers, creating an exicting explosion. Dussehra also marks the begining of the festive season with Diwali the festival of lights only 20 days away. The celebration of the monsoons is also the time to renew the tiesof fidelity for married couples in Rajasthan, and special sweetmeats and swing rides are charateristic of it. Held at Baneshwar at the time of Shivaratri (January - February) thisss is a tribal fair on the banks of the Mahi and Som rivers in the forested area around the border of Rajasthan that it shares with Madhya Pradesh and Gujarat. Bhil tribals form all three states gather here to worship Shiva and set camp in colourful groups. Held in Bikaner in January this celebration cleebrated the only camel breeding farm in the country. Not unexpectedly most of the events are staged around this beast, with camel races and camel dances. There are also several folk performances and this may also be your chance to experience the rare fire dance staged late at night. Held a few days before Holi in March in Brij area near Bharatpur. It is a featival of music and dance. The people from Jaipur's rural pocketscome here for the colourful festival around situated about 22 from Jaipur. The annual desert festival is held in Jaiselmerand it is a very important festival now a days. It is a showcase of performing arts stretching over the sand in the desert. There are camel racesand turban tying competitions. During Holi in Jaipur the elephant festival includes various attractions including a elephant polo. The caparisoned elephantts their bodies painted with floral decorations by the mahouts are a beautiful sight. It is celebrated in honour of Gauri, the goddess of abundance. Young girls adorned in their best clothes pray for a spouse of their choice. The married ladies pray for the welfare of their husbands. The women take out processions through the streets and towns holding the idols of Shiva and Parvathi. The festival is very colourful in Jaipur, Udaipur and Mandawa in the Shekhawati region. The sacred site where Kapil Muni is supposed to have meditated a fair is held here on the banks of its lakes and the air bristles with exictement. Kolayat can be visited from Bikaner. The pilgrims visit the Kolayat lake for offering and setting diyas afloat in the lake. Held in Jodhpur this annual event showcases the culture and art of the Jodhpur area. There is song and dance festival which is the part of a huge celebration. The celebration of the heritage of what once formed part of the Sisodia kingdom. It is held in coincide with Gangaur in Udaipur the whole city turns out to mark the culmination of the 18 day festival with a procession of floats on Pichola lake. A trading fair for cattle and camels is a wonderful oppurtunity to catch rural life as owners from all over the satate come to camp on the outskirts of Nagaur while they buy and sell animals. The hides of the animals are cut into beautiful patterns and it looks very beautiful. The nine days preceeding Dussehra are marked by fasting and one ritual meal a day. In the case of martial rajputs a goat is sacrificed as food for consecration and the worship of their weapons takes place. It is usually a private celebration. Pushkar has come to symbolise the fertile heartbeat of the people of the state. Held in Pushkar every year, the temple town very close to Ajmer where a 8th century temple of Bhrama is located on the bnaks of the lake. The pilgrims who come here have a bath in the ghats and pray in the temple. The fair is held in the vast desert around it. Said to be the world's largest camel fair, horses are also sold here. Folk dances, songs, cooking Authentic Rajasthani meals over camp fires and walking through the mela fo handicrafts or spinning on the giant wheel takes you to new heights of estacy. Special tented camps are set for the occasion for visitors. A large fair is held to propitiate the goddess of war whose wrath can be a terrible scrouge of small pox unless appeased by her followers. Consecrated food on this day consists of stale food left out of the previous night. The fair is held in and around the temple dedicated to goddess in Amber in Jaipur. It is one of the few festivals during the summer months. In cool environs of the hill towns it is time to relax while folk performances are staged particularly of the Bhil tribes of the region. Another festival dedicated to Shiva and Parvathi, this time it is married women who pray for a long and happy married life during the monsoons. The celebrations are held all over the state they are very colourful in Jaipur where there is a procession through the heart of the city. Women dress in their finery and spend time in groups at swings that are put up for the festival. Held in the holy town of Ajmer in honour of the Sufi saint Khwaja Moinuddin Chishti special prayers are offered at the mosque and huge amount of consecrated food offered from large steaming cauldrons that were a gift from Akbar. While quwallis are sung at night the celebrations unite people of all faiths and the complete town is decorated with buntings and wears the spirit of festivity.